For the professional trades and people who like the feel and balance of a sharp knife. We hope you can find a tool for the job, if not please contact us and we can advise and source from an extensive range of trade contacts. If we sell it we sharpen it. We are wholesalers for the brilliant Swedish Frost Mora knives. Excellent prices for a knife that will last. American Style Handsaw. 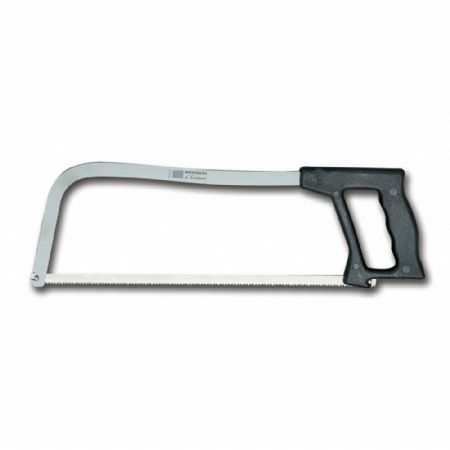 White Polyamide Handle A very high quality bone saw that is popular with all butcher and meat/larder preperation. Stainless Steel solid Frame Individually Packed comes complete with blade. An extremelly sharp stiff steak wide blade made from Sandvick 12c27 Swedish stainless knife steel. Hardened by deep refrigeration at - 80degrees for maximum hardness 58 rockwell (easily sharpened)with high edge retention and resistance to corrosion. Polyamide handle with a microblasted structure, comfortable ergonomic and safe grip in wet condition the handle also allows a firm comfortable grip helping to prevent accidents and strain injury. 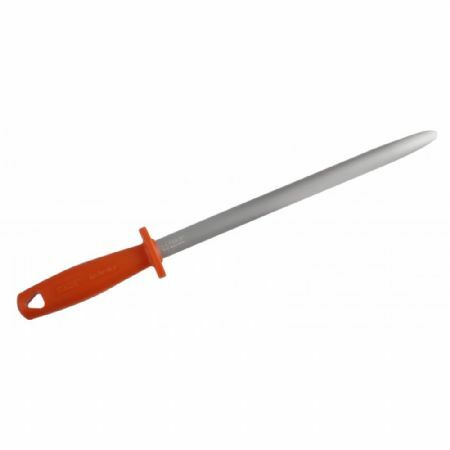 A very robust knife also used in veg packing industries as well as the usual butchery & fish production facillities. An extremelly sharp stiff straight blade made from Sandvick 12c27 Swedish stainless knife steel. Hardened by deep refrigeration at - 80degrees for maximum hardness 58 rockwell (easily sharpened)with high edge retention and resistance to corrosion. Handle polypropylene. 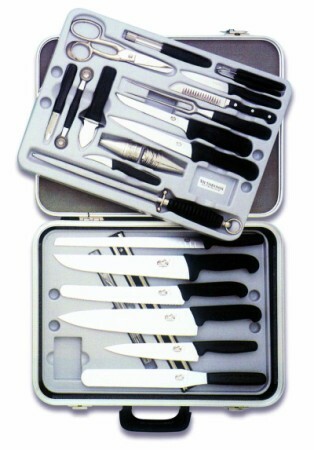 An excellent quality knife ideal for professional chefs and all users. Heat treatment : This is what provides the hardness. Thanks to our high-quality equipment, FISCHER has mastered this essential aspect of manufacturing steels. Our heat treatment guarantees a hardness of between 62 and 64 HRC which makes it possible to sharpen all knives currently on the market. Coating - All our steels are covered with an 8-micron hard chrome coating. This micro-coating increases the external hardness of the cutting edges by 3 to 4 HRC. Magnetization An indispensable process which retains minute particles of steel produced by sharpening on the steels. This is to protect foodstuffs. Food jobs, butchers, canteens, tripe butchers. The first indusrtrial sharpening steel to combine sharpening strength with resistance to corrosion for hygienic reasons. This product is especially recommended for the food industry and abattoirs. For the first time a sharpening steel can be looked after in the same way as a knife. This steel is an excellent tool for keeping the fine edge required. Fischer heat treatment guarantees a hardness of between 62 and 64 HRC which makes it possible to sharpen all knives currently on the market. Coating - All steels are covered with an 8-micron hard chrome coating. This micro-coating increases the external hardness of the cutting edges by 3 to 4 HRC. Magnetization An indispensable process which retains minute particles of steel produced by sharpening on the steels. This is to protect foodstuffs. Food jobs, butchers, canteens, tripe butchers. Multicut four sided steel. Fine on two sides and medium on the other two. Quality sharpening steel. Red polypropylene handle with hanging fitment sided shaped blade. Extra best quality to last. Made in Sheffield England by Granton knives. 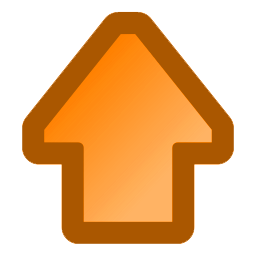 A very good steel for everday use in the workplace or home. Quality polished sharpening/honing steel. Red polypropylene handle with hanging fitment round shaped blade. Extra best quality to last. Made in Sheffield England by Granton knives. Used after a fine steel to raise and maintain the absolute edge in the workplace or home. Larder / Household Saw 350mm / 13.75" blade 11mm deep stainless steel. Epoxy Coated Frame Polyprop Handle. A very handy saw for the home butcher and hunter. Nice size and feel. Progrip knives have a double moulded rubber elastomer handle with an etched structure giving a safe warm comfortable grip in wet conditions. Blade made from Sandvik 12c27 pure Swedish stainless knife steel. Hardened by deep refrigerationat -80 degrees for maximum hardness and edge retention 58 RC(easily sharpened). Progrip knives have a double moulded rubber elastomer handle with an etched structure giving a safe warm comfortable grip in wet conditions. Semi flex blade made from Sandvik 12c27 pure Swedish stainless knife steel. Hardened by deep refrigerationat -80 degrees for maximum hardness and edge retention 58 RC(easily sharpened). An extremelly sharp flexible blade made from Sandvick 12c27 Swedish stainless knife steel. Hardened by deep refrigeration at - 80degrees for maximum hardness 58 rockwell (easily sharpened)with high edge retention and resistance to corrosion. Double moulded rubber handle with an etched structure comfortable ergonomic and safe grip in wet conditions. Used by meat and fish industries. The flex blade has been found ideal for fish production and the handle allows a firm comfortable grip helping to prevent accidents and strain injury. Also a very handy general kitchen carving knife usefull for carving bird and small joints. Progrip knives have a double moulded rubber elastomer handle with an etched structure giving a safe warm comfortable grip in wet conditions. Flexible blade made from Sandvik 12c27 pure Swedish stainless knife steel. Hardened by deep refrigerationat -80 degrees for maximum hardness and edge retention 58 RC(easily sharpened).